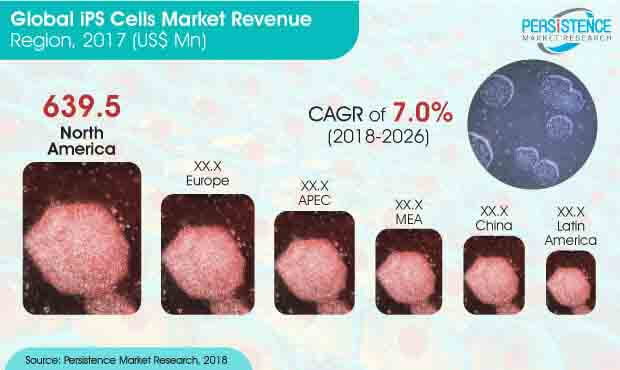 Despite the presence of several large-scale players as well as multiple regional companies in the global iPS cell market, there are very limited companies that have a complete focus on being a provider of life science reagents and products. Different manufacturers have different product offerings and specializations, with most large companies combining research products and reagents with equipment and in-vitro diagnostics tools. Having a sole focus on this market ensures better quality of products, customer loyalty and an established distribution network that can increase the availability of the product across the globe. The spending by companies on the research and development pertaining to life sciences is expected to provide lucrative prospects for growth. Companies investing in providing tools and products to cater to the research requirements of several healthcare providers and research institutes can expect to see stable returns. Growing investment in basic level research, especially by research organizations and academic institutes in the last few years has led to an increased understanding of the fundamental pathways through which iPSCs implicated in disease development are either up or down-regulated. This leads to more questions about how biology works, the cause of the diseases and potential diagnoses and treatments. Induced pluripotent stem cells display a particular gene expression signature that is similar to that of embryonic stem cells (ESCs) and exhibit both pluripotency and the capacity of self-renewal. In the recent past, the complexity of products requested by researchers has grown and this suggests improvement in understanding of the basic pathways and discovery of some new pathways. It is important for manufacturers of research products to keep up with the latest developments to cater to the ever-changing requirements of the life sciences industry. In the last few years, drug toxicity screening was a difficult process owing to the lack of human samples and thus, researchers relied on immortalized cell-based assays or in-vivo animal models for clinical trials and research. Advancements in iPSC technology in North America in several research institutes has enabled a steady supply of functional cells for pre-clinical screening of drugs. Moreover, iPSCs offers a unique platform that allows researchers to model diseases on a patient-by-patient basis. This micromedicine procedure makes it possible to understand the progression of the disease at an individual patient level and also screen for optimal pharmacological drugs individually. High-throughput analyses for drug toxicity that use human iPSC-CMs can also be conducted using macromedicine, under which iPSC-based medicine could be applied to cohorts of patients. In these clinical trials, iPSCs generated from patients could be differentiated with functional cells and are used to analyze the effectiveness of the drugs. The ongoing research in the region is expected to pave the way for future investments in the market. Europe has recently become the hub for small and large-scale biopharmaceutical companies and has become dependent on the contract research organization sector and other clinical services for research and development operations. Outsourcing of iPSCs trials has eventually bolstered the process of drug approval and will help Europe retain its place in the global market.